The war between the director and entertainment provider may be indicative of the future of movies. Netflix has clapped back at Steven Spielberg who claims the company should be competing for Emmys with its films and not Oscars despite them ensuring they meet all real qualifying criteria. The company’s PR team took to Twitter to slam Spielberg, who is currently trying to have rules changed to limit Netflix’s eligibility to compete for the Oscar’s. Alfonso Cuaron’s Netflix flick Roma made film history by almost winning the Best Picture Oscar and taking home a total of four statues for Roma and a documentary short. This success has fired Spielberg up and he has been part of a select group of industry heavyweights objecting to Netflix’s eligibility. 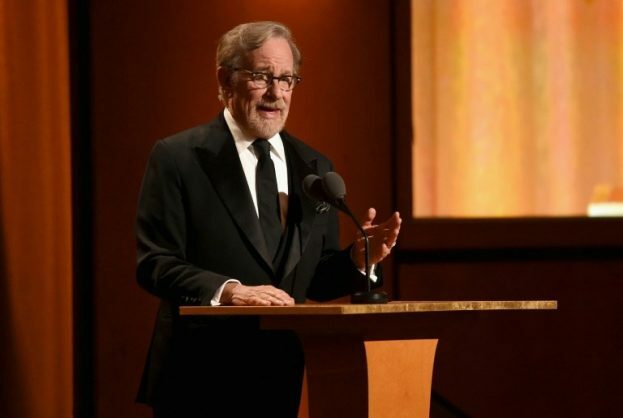 Spielberg has promised to take up the issue at a meeting of Academy leaders next month, where he is a high-level member of the Oscar-voting Academy – serving as a “governor” of the branch that represents film directors. Netflix angered Hollywood traditionalists by putting Cuarón’s Roma in select theatres for only three weeks before making it available on its digital platform, flouting the usual 90-day “window” that separates a movie’s run in theatres and its arrival in the living room. Others critics have complained about Netflix’s hugely expensive marketing campaigns to promote its movies to Academy voters (its promotional blitz for Roma may have been the most expensive ever) and grumble that Netflix refuses to conform to other traditional practices, like releasing box office results. 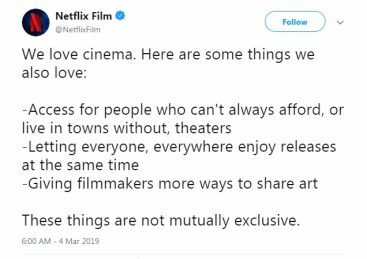 The tide of internet opinion is hugely behind Netflix, with many pointing out how hypocritical it is of Spielberg to claim he is merely doing this to defend the big screen, or quintessential movie experience. One writer, Cedric Voets, has pointed out how Spielberg’s complaint that Netflix is devaluing movies by “forever changing the quintessential cinematic experience” bizarrely echoes a compliment he gave early in his career to Alfred Hitchcock who he said had, “forever changed the quintessential cinematic experience”. Voets on Cracked.com said: “Netflix immediately releasing its movies online lures people away from the theatre, which is the only right way to watch movies. This is from the man who backed a company that wanted to deliver in-theatre movies to your home for $50 a pop in 2016. Voets also joked that Spielberg spent millions of dollars on a private home cinema so exclusive “it has a hidden entrance that only he has the key for”. Influential industry voice Franklin Leonard tweeted that Netflix had been a real boon for diversity and representation. “It’s possible that Steven Spielberg doesn’t know how difficult it is to get movies made in the legacy system as a woman or a person of color (sic),” Leonard tweeted Saturday. And as the debate grows ever larger, with the number of articles, columns, social media posts, and podcasts damning Spielberg’s “conservative thinking” continuing to grow, Spielberg himself does not appear to be backing down.